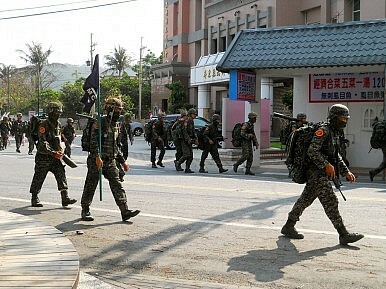 Taiwan’s military transformation from conscription to an all-volunteer system will not go well. Taiwan’s Ministry of National Defense (MND) has encountered a number of difficulties of recruiting enough professional soldiers to supplement the manpower gap left by the termination of compulsory military service. The MND’s latest report to Taiwan’s parliament reveals poor recruitment levels at roughly 30 percent of the target, between January and November 2013. In infantry and armored units, the recruitment rates are even lower, at just 4 percent and 16 percent, respectively. As a consequence, the MND has postponed the introduction of the all-volunteer military from 2015 to 2017. Some relevant policies such as increasing salary and looser requirements are proposed by the MND in order to attract more young people to join the armed forces. However, the MND’s ongoing attempts at constructing an all-volunteer military will be unlikely to succeed and will very likely undermine Taiwan’s defense capacity and capability in several ways. In terms of budget, rising personnel costs have compromised other defense expenditures. With Taiwan’s overall defense budget remaining static, the portion allocated to personnel costs has been rising back towards 50 percent, tantamount to downsizing resources for other purposes, such as maintenance, training and investment, all crucial for defense. In the face of China’s expanding and strengthening military capacity and capabilities, Taiwan with its relatively low defense budget, less than 3 percent of GDP in the last decade, has put itself in an increasingly vulnerable position. Although the MND has been able to adjust its military strategy toward asymmetrical operations through denial means, such as anti-ship missiles and stealth missile craft, a credible deterrence still requires proper military procurement, sufficient training and exercises. Given the poor performance and incidents such as aircraft crashes in recent years, cutting training and maintenance expenditure would be negative for Taiwan’s defense. In addition, since a number of outdated weapon systems of Vietnam War and even Second World War vintage are still in service, Taiwan needs to make available the consistent funding for vital renewals or upgrades. Moreover, adding capabilities such as cruise missiles to counter China’s military superiority also demands adequate investment. Thus, Taipei’s falling budget allocation to maintenance, training and investment, as it shifts resources to hire professional soldiers, will only weaken its military imbalance with Beijing. The most persuasive reason for an all-volunteer military is the short term of Taiwan’s present military service, which at one year is inadequate to training needs. Professional soldiers on multi-year contracts would solve this problem. The problem lies in attracting young people to a military career. First, despite a relatively good salary, a series of scandals have considerably damaged the reputation of the armed forces. For example, the recent death of a conscript, who had been bullied, has provoked several massive protests against the MND and numerous indictments. Other issues, such as bureaucracy and factionalism, are well known to the public through the negative experiences many conscripts report. As a consequence, young people find a military career an unappealing option. Making matters worse is the shrinking youth population caused by Taiwan’s birth rate, which has been plummeting since the 1980s, placing a structural constraint on recruitment that will only become more severe. Finally, the government has little capacity to provide additional funding for the MND to offer pay incentives, given that it is struggling with the constraints of a lackluster economy and extensive welfare issues. Since its democratization in the 1990s, the conscription system has been unpopular in Taiwan, and the incumbent President Ma Ying-jeou pledged during his campaign to end it. Given Ma’s current political problems, the MND is unlikely to renege on that promise. Yet the effort seems unlikely to succeed, and the MND will face increasing budget pressure from rising personnel costs. All the while China’s military edge will grow, leaving Taiwan looking increasingly vulnerable. Shang-su Wu is a research fellow in the Military Studies Programme, a constitute unit of the S. Rajaratnam School of International Studies (RSIS), Nanyang Technological University, Singapore. The dirty secret in cross-Strait relations: China’s political system is the biggest barrier to unification. A Tsai Win and China TiesTaiwan's Energy Security BattleTaiwan Mulls Post-US PacificChina's Military SurprisesTaiwan's KMT—Hollow Victory?